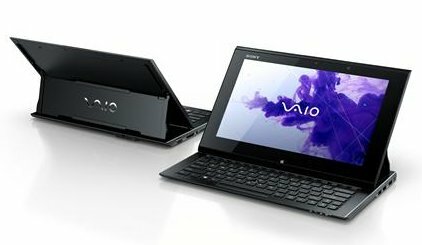 Sony presents the VAIO Duo 11, a Windows 8 ultrabook that can be transformed into a tablet. The 11.6" device is 17.85mm thin and weighs 1.3kg, it comes with a digitizer stylus pen and offers a capacitive touchscreen with a 1920 x 1080 pixel resolution! It's Ivy Bridge based with Intel Core i7-3517U/Core i5-3317U/Core i3-3217U processor options, 4GB to 8GB DDR3L 1600MHz memory, 128GB/256GB SSD, integrated graphics 802.11n WiFi, Bluetooth 4.0 + HS, Ethernet, two USB 3.0 ports, HDMI, VGA, memory card reader (SD/Memory Stick Duo), two full HD 2.07MP webcams (front and rear), NFC, GPS, and an optional extended battery pack. Shipments will start in late October. With its premium Surf Slider™ design, the powerful VAIOTM Duo 11 PC switches smoothly between keyboard and tablet modes to give the best computing experience - wherever you are and whatever you’re doing.